From the 1st April 2006 The Water Environment (Controlled Activities) (Scotland) Regulations 2005 (CAR), made it an offence for construction sites, discharging to the water environment, to operate without a Sustainable Urban Drainage System or equivalent treatment system. DBA offers bespoke construction phase surface water management solutions and on-going water quality monitoring to assist Clients and Contractors meet their Statutory obligations. 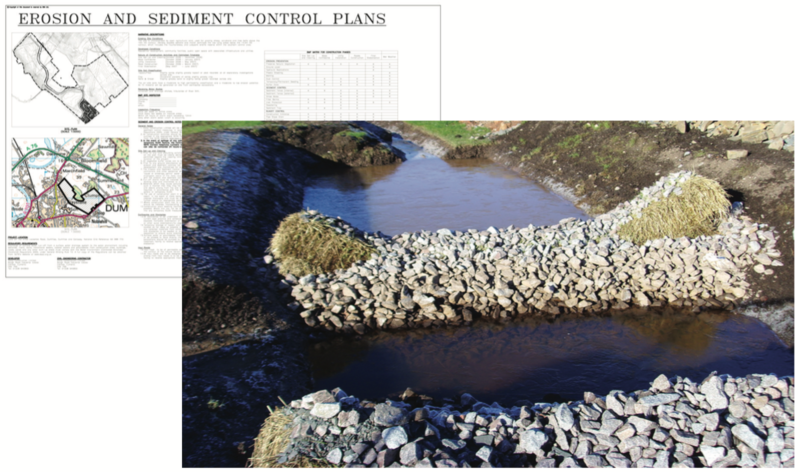 The service we provide identifies and assesses site specific constraints allowing development of an Erosion & Sediment Control Plan. The Plan is presented in an easy to read format that can be displayed on-site outlining contractors obligations, details of easily installed best practice techniques and emergency procedures. In consultation with SEPA, we have developed and implemented cost effective Plans for construction projects discharging to environmentally sensitive locations such as Sites of Special Scientific Interest (SSSI) and Local Nature Reserves. In these unique situations, effective water management has been coupled with ecological assessment to provide systems that have the flexibility and robustness required in sensitive catchments.